From the Wedding Halls To the Streets. Style for every occasion. I can be hand washed but prefer dry cleaning. Baby Muffin Specializes in turning little moments into treasured memories. Making the art of dressing his finest a magical first class experience. Our boys' first class slim suits are designed with a slim tapered silhouette. Using traditional craftsmanship with the charms of the salad days. Creating a timeless suit with a modern edge. Colorful, sheen and vibrant fabrics to balance the customary colors. Curated with the finest material that are rich, soft and smooth. Our blazers are lightweight and breathable—aka, it's as comfy as it is cool. Fully lined with hand stitching and piping around the interior borders of the blazer. Two matching ticket pockets with lightly padded shoulders to enhance the structure of the suit. 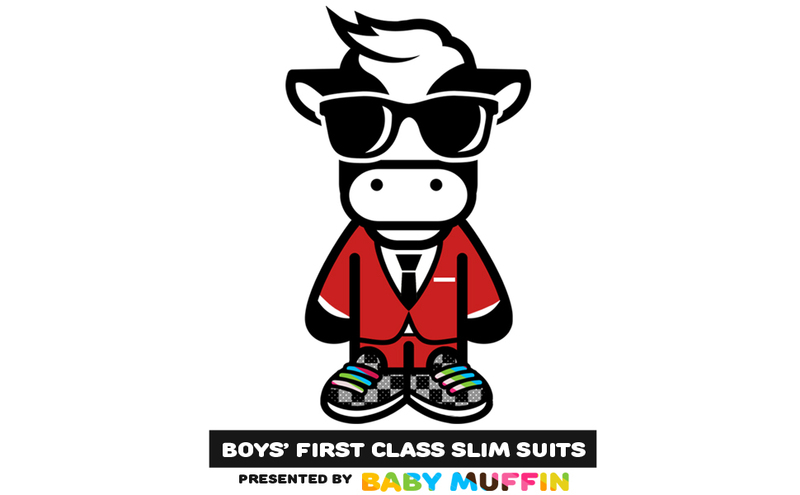 Designed with our custom trademarked baby muffin emblem for the inner lining. A hidden luxurious touch only for those who wear it. Nailing the dress code while remaining an individual. Our first class slim suits features a generous fit that keeps him comfy and sharp. Your little buddy will take pride knowing his suit was exclusively tailored for him. Made for those who appreciate the little details where quality and exquisite designs are paramount. Sharing the same common language of style with a universal love of fine aesthetics. Sophisticated, Polished, Sharp and Modern the essential elements to our crafting our boys' first class slim suits. Impeccably tailored by Black n Bianco. Warning! Our suits are known to be a camera magnet. It may cause excessive flashing lights and endless hugs and kisses. Wear it responsibly with delicate care and love. I wanted my little boy to wear a suit for Easter and I’m so glad I came across this website. My little boy looked soo handsome in his suit he literally made people stop and take another look. Plus he got so many compliments. We will be getting another suit.